Newspaper gives you the freedom to transform the category pages into creative interfaces that guide the visitors to the desired content. You have multiple templates for the category header and on the top section, you can use different delightful grids and styles. You can display your posts in various ways, customize your sidebars, and use unlimited colors and background options for all category templates. You have dozens of combinations to try and endless possibilities to make your website an amazing user experience for visitors. The category template option from the theme panel changes the header of the category. To change the category template for an individual category go to Newspaper > Theme Panel> Categories and select your desired category. The theme comes with 8 different styles for the category header section. 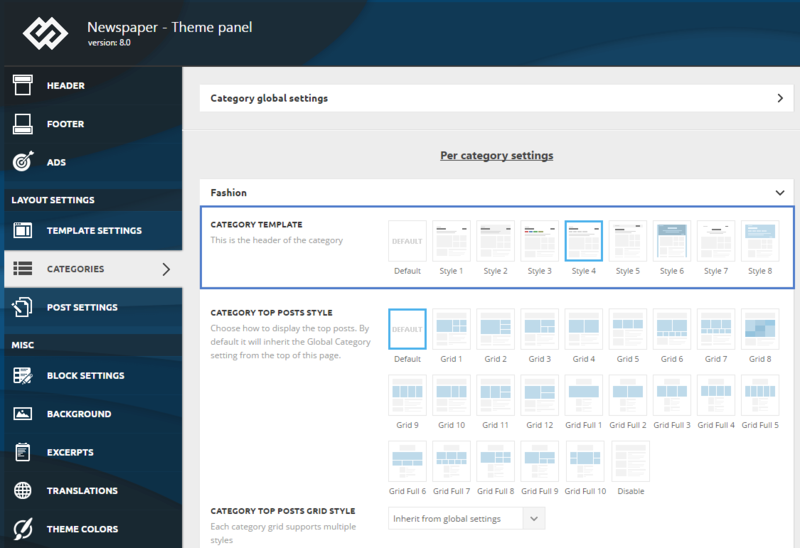 If you choose the default style on a specific category, the theme will apply the global category settings. Sorting order drop-down box > Filter the way your articles display under your category. You can change the order of posts displayed on your category page using the following filters: Latest, Featured Post, Most popular, 7 days popular, By review score or Random.